In a significant development in the ongoing tussle in Punjabi University, Patiala, the Punjab government has curtailed the powers of vice-chancellor (VC) Swaran Singh Boparai. Thousands of rural unemployed of Jalandhar, Nawanshahr and Amritsar districts will get employment by May 20 under the second phase of the centre-sponsored National Rural Employment Guarantee Programme. The post of the chief chemical examiner to the Punjab government enjoys immense power. The government should curtail its power in the interest of justice. In a major bid to modernise infrastructure in Punjab, the UK-based Sun group today expressed its readiness to set up a “first-of-its-kind” rural development institute at Nabha and an Indian institute of public health with a combined outlay of over Rs 100 crore. Reacting to the contents of an interview of former Chief Minister Amarinder Singh published in a newspaper today, Punjab’s youngest minister Bikram Singh Majithia said today that Amarinder Singh was showing signs of frustration as he was finding himself a loner in politics. Allegations are being raised against Punjab Chief Minister Parkash Singh Badal for not ordering any inquiry into the alleged involvement of his two ministers in the human-trafficking racket during his previous tenure. The Youth Congress has drawn up an action plan to counter the “political vendetta” let loose by the ruling SAD-BJP alliance government against Congressmen in Punjab from May 1. President of the Punjab Youth Congress Vijay Inder Singla said here today that though the move of the SAD-BJP alliance to extend the retirement age of medical teachers to 60 years was a welcome step, the recruitment process started by the previous Congress government should also continue. On account of erroneous affidavits filed by the various state governments regarding the number of scavengers partially or wholly engaged in the obnoxious and inhuman occupation of manually removing night soil, the UPA government has been compelled to extend the period for eradicating the uncivilised profession from December, 2007, to March, 2009. 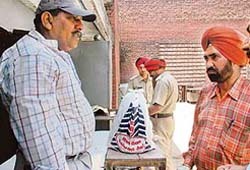 The vigilance bureau today accused former local bodies minister Chaudhary Jagjit Singh of receiving kickbacks worth at least Rs 1 crore in the City Centre scam. The bureau said the figure might swell more after further investigation. Taking a serious note of death of a prisoner in Ludhiana Central Jail, the Punjab Human Rights Commission has held jail authorities guilty of negligence for failing to protect the life of the deceased. Rooted deep in religion, a senior IAS officer from Punjab has branched out to nurture the tree of knowledge. After travelling over 30,000 km across India and Pakistan, the 1976-batch officer, D. S. Jaspal, has faithfully revived the sacred link between Sikh shrines and the “divine” trees by religiously capturing in his 12-mega pixel camera the visible, yet indiscernible, realities of growth and decay. 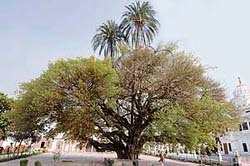 The sacred tree at Ber Sahib in Sultanpur Lodhi. “I will be forced to seek legal remedies against the dilly-dallying tactics of Swiss Embassy officials if they do not stop harassing and creating obstructions in my taking my husband along to my country”, said Claude Francoise, a resident of Switzerland. Following reports that pollution in the holy city has gone up, the Shiromani Gurdwara Parbandhak Committee has stopped the chapatti-making machine in the Golden Temple premises after four years of its installation. The Guru Gobind Singh Foundation has decided to call upon international and national constitutional bodies to adopt a declaration to commemorate the tercentenary --- due next year --- of the investiture of spiritual authority on Guru Granth Sahib as the eternally living Guru. Nirmal Singh auction recorder of Chak Fateh Singh Wala village purchase centre was suspended and the licence of commission agent Birbal Das Thakur Das was cancelled by deputy commissioner Rahul Bhandari after checking wheat procurement in the district today. Punjab is heading for self- destruction because of the excessive use of ground water for agricultural and other purposes. SSP Anita Punj said here today that the district police arrested two fake travel agents, Paramjit Singh of Bhangala village, Jalandhar, and Satnam Singh, alias Babba, of Kariavir Sarkar Maulanawala, Ferozepore, under sections 420 and 406 of the IPC. With the arrest of four boys and as many girls, the local police today busted a flesh trade racket being operated by its kingpin, a woman, from her rented house in Gobind Nagar here. The district police has arrested six accused persons involved in damaging the secular pillar erected by Sirsa-based Dera Sacha Sauda at Mansa crossing on the night of April 22. The district police has unearthed a racket in which thousands of litres of synthetic milk was being produced and supplied in market. In a press statement here today, the SSP, Patiala, said last evening they raided the premises at Samana that were being used to produce synthetic milk. The Frankfinn Aviation Services today announced a tie-up with State Bank of Patiala making the bank its preferred partner to provide finances to the students of the institute. The Excise and Taxation Department received only a handful of applications for 12 liquor shops in the town on the last day of submitting forms sources said this evening. The government under the revised excise policy has reduced number of sale outlets from 17 to 12 leaving it to the licensees to chose locations but the non-refundable fee was increased from Rs 45 lakh to 60 lakh for 11 months as the government decided to fix next allotments for last week of March 2008.Traditional traders virtually has lost interest in the liquor shops in urban areas due to tough competition but had preference for rural areas as was evident from the applications received at the district headquarter.